Successfully Added Xiaomi Redmi Note 4 Android Phone - Android 6.0, Deca Core CPU, 5.5 Inch FHD Display, 3GB RAM, 64GB Memory (Black) to your Shopping Cart. With its sleek design and beautiful 5.5 Inch Full-HD display, the Xiaomi Redmi Note 4 certainly is a stunning Android phone that lets you enjoy all the latest features in style. Portraying all media in stunning 1080p resolution, this mobile phone brings forth vivid color and breathtaking visuals when enjoying your favorite movies, games, or applications. Its MIUI 8 Operating System has been based on Android 6.0, guaranteeing that the phone supports all the latest features Android users are familiar with. No matter your demands, this Chinese smartphone brings forth a powerful performance that is guaranteed to put a smile on your face. Bringing connectivity to the next level, this Android smartphone supports Dual-IMEI numbers along with 4G connectivity. Allowing you to be connected to two providers at once brings along great efficiency when traveling abroad as now you’ll be able to browse the web at local charges while, at the same time, staying connected to friends and family back home with your old and familiar phone number. 4G connectivity supports the fastest data transfer speeds out there, ensuring that no matter where you’re at, you’ll be able to browse the web at lightning speeds. Packing a powerful Deca-Core CPU that has been clocked at 2.1GHz, this Android mobile phone is capable of tackling mobile games, streaming Full-HD movies, and running the most demanding Android applications. With its 64GB of internal memory and 128GB SD card slot, worrying about storage space will be an issue of the past. Providing access to the Google Play store, this Android phone brings along counties possibilities for entertainment on the go – ensuring that you’ll never have to feel bored again. Additionally, its 4100mAh battery delivers numerous hours of continuous usage time – getting you through the most demanding of days without the need to recharge your Android device. For all smartphone photography lovers out there, the Xiaomi Redmi Note 4 packs a sophisticated 13MP rear camera. Shooting high-quality pictures and stunning video on the go has never been easier. Additionally, the phone supports a 5MP front snapper that brings plenty of possibilities for all selfie lovers out there. It furthermore lets you engage in HD video calls at any time of the day, allowing you to stay in touch with all your loved ones no matter where you’re at. 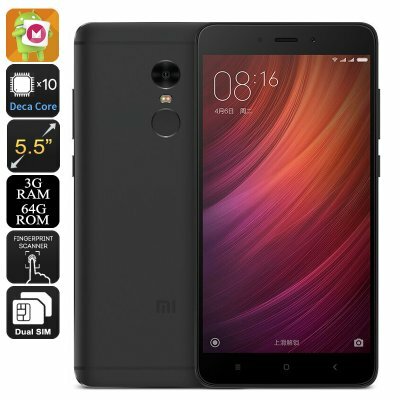 The Xiaomi Redmi Note 4 Pro comes with a 12 months warranty, brought to you by the leader in electronic devices as well as wholesale electronic gadgets..